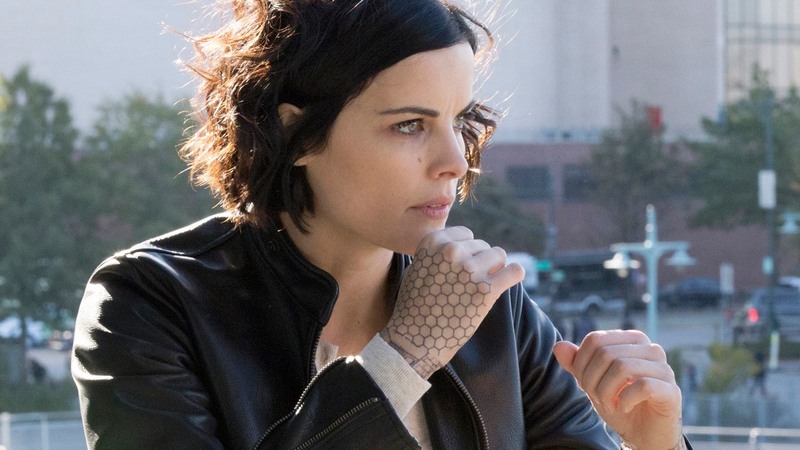 Blindspot capped off their successful first half of the season with a poignant and suspenseful midseason finale. As is typical with this show, the cognitive and emotional answers lead to more questions. However, "Evil Handmade Instrument" asks us to focus more on the here and now rather than the future. Sadly, the case of the week was solving David's murder. It turns out Mayfair put an agent on the reference book that Patterson and David found. The agent was the man following David in "Authentic Flirt," and he discovered David's body. The reference book ultimately leads the team to three Russian sleeper agents. All three spies are married to American citizens. David's murder triggers their plan to assassinate targets who threaten Putin's rule. Kate — the Russian spy who murdered David — mistook him for an FBI agent. She killed him because she believed her cover was blown. It's salt an open wound. Yes, there was an FBI agent following Kate, but it wasn't David. He was simply in the wrong place at the wrong time. Or rather, he put himself in the wrong place in the wrong time. David hoped to crack Jane's case so he could reunite with Patterson. The reference book had merit, which is why Mayfair put an agent on it. David didn't need to investigate it because the FBI already was. If David stayed away as instructed, the other FBI agent may have discovered the fingerprint leading to the Russian spies. The difference being, of course, that David would still be alive. Somehow it makes his death all the more heartbreaking. That said, maybe Kate would have murdered the other FBI agent instead. It's impossible to know for sure. What we do know is that David did not die in vain. His death lead the team to the Russian spies and, as a result, they saved two lives. David's death also illuminates a thin, but connective, thread between Jane and the Russian agents. One of the Russian spies, Olivia Delidio, was a starving orphan. She had nothing and no one when she was recruited. Becoming a Russian spy was a means of survival. Jane flashes back to a memory, shortly after her abduction, of the basement filled with malnourished children All of the cases thus far revealed government corruption. Is it possible the United States has a similar program as Russia? Poor, starving, and orphaned children are recruited and trained as spies. What if the children aren't orphaned, but kidnapped and sold? It could explain why the tattoos target government corruption. It could also explain why Jane willingly wiped her memory. Perhaps this program molded into Jane into whoever she use to be — someone she didn't even recognize. Maybe the only way to break that mold was to eradicate its existence. The MVP of "Evil Handmade Instrument" was Ashley Johnson, who plays Patterson. Johnson slowly and deliberately moved Patterson through the stages of grief. Her subtle performance was elegant without being cliche. That said, Johnson did not shy away from the emotional scenes, giving them the weight they deserved. Patterson served as a microcosm to Jane's nine episode journey — her need to solve David's murder mirrored Jane's need to solve her own case. Because solving David's case gave Patterson control over chaos. Jane continually tries to controls what little she can. It is Patterson's interrogation of Olivia Delidio, along with her fingerprint and handwriting analysis bluff, that cracks David's case wide open. Jane is often the linchpin in the case of the week. Their mirrored experience allows Jane and Patterson to connect on a deeper, emotional level. Solving David's murder brings little comfort to Patterson. He's still dead. Just like solving the tattoos brings Jane little comfort. No matter what answers she finds, her memory is still gone. Answers don't change the end result for either woman. And that is a difficult, painful and hollow reality to accept. Patterson opens up to Jane because she understands her pain and knows Jane can understand hers. Finally, Patterson breaks down. The grief, regret, and pain overwhelm her. She admits to Jane what she could never admit to David — she loved him. Instead of holding onto David for dear life, she let her fear push him away and now it is too late. Just like Patterson can see herself in Jane, Jane can see herself in Patterson. Patterson's emotional microcosm, and the lesson that accompanied it, is one Jane can apply to her journey so far. Jane is searching for control over chaos. One of the few things she has control over is her emotions. Her fear of the unknown is pushing Weller — and her feelings for him — away. Only for Jane... it's not too late. Early on, Jane confesses to Kurt that she's never lost anyone before. Kurt tells her she's lucky. The pain Patterson is experiencing is pain that Kurt is familiar with. He lost Taylor Shaw. But Jane's amnesia gives her a reprieve from the pain of any grief she experienced in her life before. So, yes, in that way, Jane is lucky. Still, I cannot agree with Jane's assessment. Because she has lost someone — herself. While every tattoo brings her closer to answers, they also serve to reveal how much Jane has lost. The continual loss of her identity is just as painful as the loss of a loved one. Perhaps, even more acute. It is why Patterson connects to Jane in her moment of grief. Regret is one of the worst feelings in the world. Not only is Patterson dealing with the grief of David's death, but also the regret of all the things left unsaid and undone between them. Jane can see herself in Patterson and doesn't want the regret the woman is carrying. Throughout the first half of this season, Kurt and Jane's relationship has been a series of push and pull moments. Their connection pulls them together, in an almost instinctual way, but their fear of that connection and what it means is what pushes them apart. Every episode, every moment, is an ebb and flow of this dynamic. "Evil Handmade Instrument" is when the push and pull stops. After Patterson's emotional breakdown, Jane sneaks out to see Weller. He's angry she skipped out on her protective detail, and then concerned when she explains she needed to see him. Kurt asks Jane if she's all right and... she kisses him in response! It's almost as if time stood still during that kiss. Jane wrapped her arms around Kurt in a very romantic, but also very innocent way. After all, this is her first kiss. While there is a moment of hesitation, probably from pure nerves, Jane's intent in clear. No more second guessing. No more fear. She cannot remember her past. She doesn't know what the future holds. All she knows is the here and now. Jane gives up control, so for one moment, she can just be. The only one person she wants to be with is Kurt Weller. Jane may not know who she is, what clothes or music she likes, her favorite food, or even her favorite color. Her cognitive abilities — like flying a helicopter or speaking Russian — are as surprising to Jane as they are to everyone else. Even the known is an unknown. But love is not merely a cognitive thought. Love is more than memory. It is emotion. It exists beyond the mind and in the heart. It is why Jane cannot know who she is and still know she loves Kurt Weller. Perhaps they are not ready to call it love, but they are ready to act on it. It had to be Jane to make the first move. Kurt's natural instinct is to protect Jane, even from himself. He would never want to push her too far or too fast into something she wasn't ready for. Jane's kiss eradicated the boundary line they both had an equal role in creating. Kurt's sweet and joyful smile when Jane referenced them as an "us" meant defining their relationship in such a context was equally as important to Weller as the kiss. Jane isn't just some girl to Kurt Weller. She's the girl. Some will say it is too early for a first kiss between the pairing, and that Blindspot is moving quicker than they should. But a midseason finale is often the fork in the road for a show — especially one in its freshman season — and midseason finales are known for twists and shake-ups. Jane and Kurt's kiss was simply a pause before that turn at the fork in the road is taken. It was the perfect moment. Time stood still. The point, I think, isn't to question the timing. The point is simply to enjoy the moment. We need to allow Kurt and Jane to just be, to exist together, with no regrets. Kurt's nephew interrupts (Seriously, kid. Worst timing ever.) and the clock begins ticking once again. It seems as if their paths are finally merging into one, but when Jane is kidnapped and thrown into a van, the truth is revealed. And the truth is that Kurt and Jane are headed in separate directions. Earlier in the episode, as Carter pontificated to Mayfair yet again, I said to my husband, "Carter is the worst. Can't they kill him already?" Suffice it to say, I was overjoyed that Carter met a bullet after waterboarding Jane. However, my joy was tempered at the sight of Jane's savior — Mr. Tree Tattoo. Great. Jane's past — Mr. Tree Tattoo — is crashing into her present: Kurt. Whatever her relationship with Mr. Tree Tattoo is, and it looks significant because there was a ring involved, it will serve to confuse her, especially in her relationship with Kurt. Jane will do battle with what she should feel versus what she is feeling. And Mr. Tree Tattoo is definitely a sharp left in Jane and Kurt's journey toward one another. That is why we were given the first kiss now — it was finally a moment of clarity. When the world grew quiet, Jane reached for Kurt and held on tight. These two may be headed down divergent paths, but they will find one another again. When all is said and done, what Kurt and Jane want is each other. They just want to be an "us." "Give me one day to be here with my team because I know that I can help." Ugh, Patterson just broke my heart this episode. Existing skill alert! Jane can draw. That was quite the murder board, complete with red string and everything. "Of course you speak Russian" HA! Jane's new wardrobe includes a super cool black leather jacket. Strong choice, Zappata and Patterson. Carter is dead, so I don't anticipate Zappata's resignation will last very long.